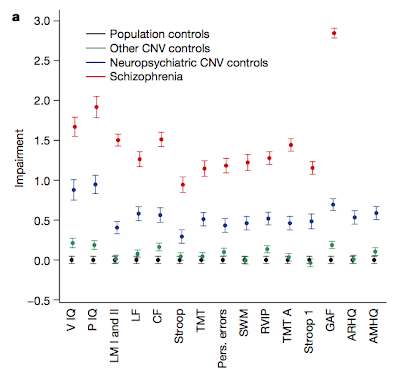 CNVs (structural genomic variants) associated with increased autism and schizo risk are found to depress cognitive function in carriers who do not present for either condition. There are also effects on physical brain structure. This is the future of neuroscience: read out the genome and look for the direct effect on phenotype. Assuming the results hold up, we can conclude that these mutations cause abnormal cognitive function in humans. We are just at the beginning of this line of research: mutations of smaller effect size will require larger samples to detect, but they almost certainly exist. Note this is deCODE and Kari Stefansson -- they have access to all health records and genotypes in Iceland. See also deCODE, de novo mutations, and autism risk. 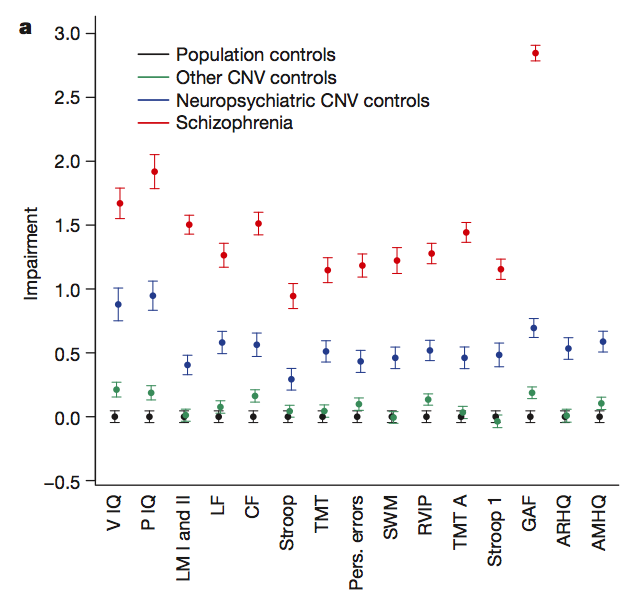 In a small fraction of patients with schizophrenia or autism, alleles of copy-number variants (CNVs) in their genomes are probably the strongest factors contributing to the pathogenesis of the disease. These CNVs may provide an entry point for investigations into the mechanisms of brain function and dysfunction alike. They are not fully penetrant and offer an opportunity to study their effects separate from that of manifest disease. Here we show in an Icelandic sample that a few of the CNVs clearly alter fecundity (measured as the number of children by age 45). 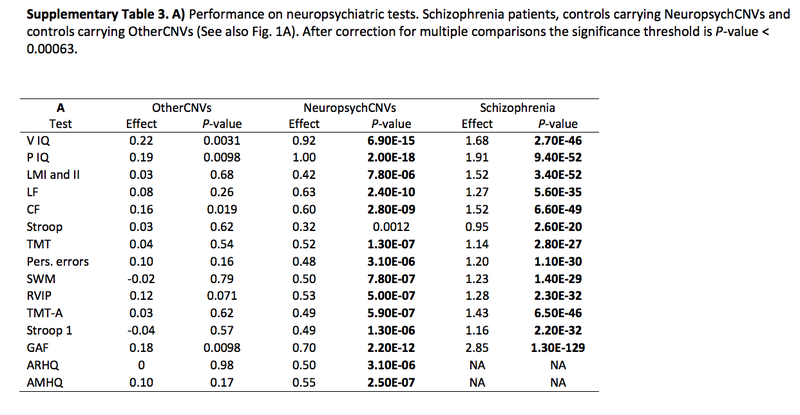 Furthermore, we use various tests of cognitive function to demonstrate that control subjects carrying the CNVs perform at a level that is between that of schizophrenia patients and population controls. The CNVs do not all affect the same cognitive domains, hence the cognitive deficits that drive or accompany the pathogenesis vary from one CNV to another. Controls carrying the chromosome 15q11.2 deletion between breakpoints 1 and 2 (15q11.2(BP1-BP2) deletion) have a history of dyslexia and dyscalculia, even after adjusting for IQ in the analysis, and the CNV only confers modest effects on other cognitive traits. The 15q11.2(BP1-BP2) deletion affects brain structure in a pattern consistent with both that observed during first-episode psychosis in schizophrenia and that of structural correlates in dyslexia. This figure shows impairment in population SDs for different groups. V IQ and P IQ are Verbal and Performance IQ (Wechsler), IIUC. My guess is that most intelligence alleles have negative effect. That is, the majority of genetic variation in cognitive ability is determined by the number and type of somewhat deleterious mutations we all carry around. (There are probably also minor alleles of positive effect, but fewer of them.) Note the CNVs in this article, while having a significantly (1 SD) negative effect on IQ, do not prevent reproduction (fecundity is reduced, but not to zero), so clearly mutations of large effect can linger for some generations. Mutations of smaller effect might even be neutral due to pleiotropy, etc. "we can conclude that these mutations cause abnormal cognitive function"
or cause something which under the right circumstances causes this or is associated always with something which causes this. all poodles have curly fur and a top knot. scz is something like 1/4 as likely among those in the top quartile of iq as those in the bottom, but i have heard of cases where the iq falls dramatically after the diagnosis. As a dyslexia locus, it's near by DYX1C1. Linkage analyses showed two causal variants: 1 at 21, and one upstream - this might be it. Should be worth a look. "My guess is that most intelligence alleles have negative effect. That is, the majority of genetic variation in cognitive ability is determined by the number and type of somewhat deleterious mutations we all carry around." This is so counter-intuitive. If this were true, it would mean that Da Vinci and Feynman were extremely average, genetically speaking. Averaging will remove rare variants, and if most of them are negative, then the trait value will increase. "so clearly mutations of large effect can linger for some generations." it's not as if number of offspring for this group in late 20th early 21st c iceland is an indication of the same number in the time of snorri sturluson. scz females have more children don't they? and women with iqs > 130 the fewest. and never married childless women are the most over-represented group among centenarians. i'll take that kind of un-fitness any day. spearman's law + heritability for g only + most average are smartest = ceiling of genetic/biological ability is not very high and gladwell was right. i looked it up. a study in finland showed that scz females had only 45% the fertility of non-scz females; some studies in the us show no difference between scz females and non-scz. but i'm sure i remember hearing that scz females have more children somewhere. this just goes to show the TOTAL meaninglessness of social science and psychology. the laws of physics presumably don't vary over time and place, but societies do. reproducibility for the above study, for example, would require tests in parts of the world (like new guinea) with few scientists and no equipment. > Would it be meaningful to calculate "average genomes" for population groups which differ significantly in IQ, say 1 SD or more, and compare them with an eye to matches to putative IQ genes? I believe this is similar to what Stephen's group is doing at BGI (where the population groups are a high IQ sample and an average control). How common are the CNVs in general, and what percentage of the variance do they account for IQ. Are the CNVs de novo? "How common are the CNVs in general, and what percentage of the variance do they account for IQ." Good question! Another good question is How much should this add to heritability estimates based on Yang-Visscher estimates, since those are based on the assumption that only SNPs and variants associated with SNPs affect phenotype? This is also relevant to the one-sided debate over repeat-polymorphism candidate-gene studies, which are so out of fashion.but cannot be disproved by SNP GWAS. We are supposed to believe that neurotransmitters have complex genetics because HMG-CoA reductase has complex genetics, but Vimaleswaran et al compared candidate-gene studies to GWAS results for obesity and determined that candidate-gene research had “evidence for enrichment” such that “the candidate gene approach retains some value.” Forgive the sacrilege, for they know not what they do. Everyone has structural variants in their genome. IIUC from the article, about 1% of the Icelandic population has neuropsychiatric CNVs as defined in the study. I agree it is similar to (but not the same as) the BGI study design. I don't know how different it is to compare two populations selected by extreme individual phenotype (BGI) versus two populations representative of groups with extreme average group phenotypes (e.g. I would expect these groups to differ with respect to regression to the mean and to be more likely to have similar profiles of +/- IQ alleles). I suspect the study design I describe would have higher power to detect intergroup differences. Understood. Do you have any data for variation of mutation rates between large human populations (presumably there are small group outliers like people living on an old toxic waste dump)? Most of what I have seen discusses male/female variation. Any idea how much of mutation rate variation is genetic and how much due to environment? What leads you to assume "heritability for g only"? It seems to me the arguments presented here should apply to most quantitative traits. It sounds like they are treating the CNVs as discrete variables (e.g. binary) rather than continuous. How do you feel about that? Can you comment on how the BGI study is handling them? What about other forms of structural variation? It seems like you are equating CNVs and structural variants here and above. The terminology I learned had CNVs as a subcategory of structural variants. Is the usage here common? Another example, in the excerpt above they mention a deletion as a CNV (IIUC). Though arguably true (0 vs. 1 as a copy number), is this usage also common? A reductio ad absurdum, surely? steve has pointed out that according to one study gladwell's "a 120 iq is sufficient" is false, but if gladwell had said "a genetic true score of 120 is sufficient" i think he would have been nearly correct. even assuming high iq was as heritable as not so high those at the extreme high end are much farther from their genetic "true score" than those in the middle. if you test at 160 you've been lucky in more ways than genes. if you had an identical twin he almost certainly would score much lower. the g mongers can't have their cake and eat it too, but perhaps the data showing heritability is almost entirely for g only doesn't apply to the high end. if it did and if it applied to all populations then the difference in factor scores (or cognitive profile) from one population to another would be explained by cultural differences. if only all quantitative traits were natural kinds. they may not be. i don't know what the trouble is at bgi or why steve can't talk about it. if the results were nill wouldn't those be published? i wouldn't be surprised if eventually it is shown that genes can predict the difference between an iq of 80 and an iq of 120 but can't predict the difference between 120 and 160.
i don't know what the trouble is at bgi or why steve can't talk about it. if there were no results wouldn't those be published? predict the difference between 120 and 160. I couldn't find any info on Johnson Parks, but of the four remaining longest lived Americans only one had any children. Five of the ten longest lived men are Americans. If their long life was due to genes, this confirms the hyposthesis that there are pro-longevity genes, but they tend to reduce reproductive fitness. But to me it means "fitness" is a purely technical term. I'd love to be as unfit as Emeliano del Toro, who worked cutting cane until he was 81. http://en.wikipedia.org/wiki/Emiliano_Mercado_del_Toro. That's interesting. 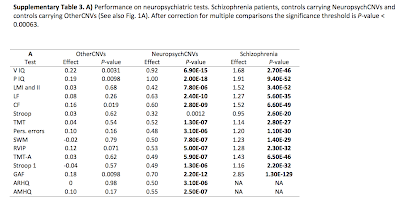 My brother has schizophrenia and he tested an average of 140 on two tests prior to his onset.